Dominion: Card Power Levels | Wake up, Meeples! This article has been a long time in the making, and it’s going to be a big one, but there is a lot of information here. Let’s get to it. At some point on our Dominion journey we’ll all be at that point where we understand the fundamentals of the game and we’re starting to get good at the game; we come across a board and get completely destroyed by a card that seemingly came out of nowhere. Or maybe there’s a card that we see some potential in but we just can’t seem to make it work. Wouldn’t it be nice to have a general idea of the super-power cards to look out for, so we can focus on understanding them better? I’m looking to compile some data for an article I plan to write, and you can help by filling out this form! It took me about 15 minutes to complete. Feel free to share wherever you’d like. I’ll publish a draft article on reddit and on my blog when it’s complete. 2.You can pick and choose which cards you rate — feel free to leave some cards blank if you don’t want to rate them for whatever reason. 3.If you aren’t using every number at least once (and preferably more than once) then you may want to consider adjusting your criteria so that all ratings 0-10 are actually useful. 4.You may use whatever criteria you like for your ratings, but I have a guideline that can be used as an example or a template if you would like something to get you started — the examples in parentheses are just my opinions, feel free to disagree! Landmarks can sort of be judged on a similar scale, kind of. Again, feel free to rate Landmarks using whatever criteria you want, but I personally would give higher scores to landmarks that are more likely to influence the strategy, tactics, and/or outcome of the game. Five. I’m aware that these ratings are similar to Qvist’s cards lists, I’ve talked with him about using his data and what I’m going for here is a comparison of cards with different costs, while taking those costs into account. While his web portal supports doing a ranking of cards just like this to aid in making an ordered list by cost, the data from that unfortunately can’t be used for what I’m going for. Your participation is completely voluntary and it would really help me out. Thanks! The response was great! I felt I could have some useful data with 20 responses and I got about twice that. The purpose of this article is to present the data by looking at it from as many viewpoints as possible and clarifying what can actually be useful when it comes to playing games of Dominion. Here’s a link to the raw data. The rows below the black line are each person’s submission, with their name replaced by a letter code (just in case someone didn’t want their ratings shared). Here’s a link to the Excel spreadsheet where I’m taking these screenshots from. I’m not using a Google Doc for this because Google Spreadsheets don’t support some of the features I wanted to use for presenting this data. In any case, you’re free to download a copy of that data and I encourage you to play around with it if you’d like! So let’s talk briefly about what the data actually means. A bunch of different people rated Dominion cards using whatever criteria they felt was appropriate. My definition of what constitutes a 10/10 could be very different from someone else’s, and this fact has to be kept in mind when interpreting every result we get from the data. It can be perfectly reasonable to completely agree on a card’s power level and rate it up to two scores apart. With that said, I’ll just give you what you probably came here for, here’s the ordered list of all of the cards, sorted by mean rating. So let’s be clear about what this does NOT mean. Just because Market was in 190th place and Trading Post was in 191st place, doesn’t mean that I should always buy Market over Trading Post 100% of the time whenever I have the choice — that’s ridiculous. It means that they are somewhere in the middle in terms of overall power level. That’s basically it. It can be pretty dangerous to go extrapolating from this point. This is the top of the heap: every card you see here has the potential to be the focus of an entire strategy because it’s just so powerful. Most of the time these cards aren’t ignorable and when they are, you typically need a compelling reason for it. 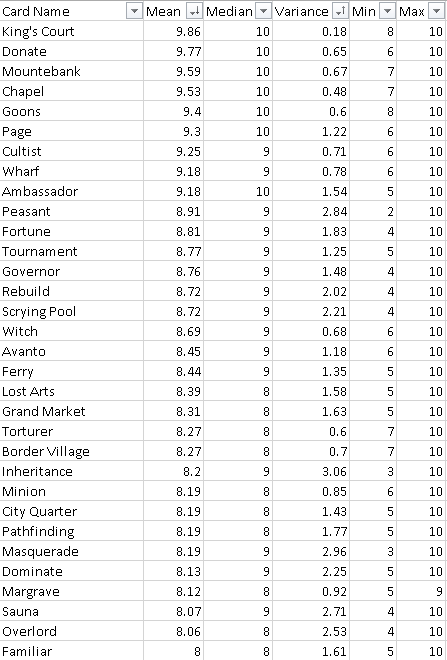 Especially notable are the ones towards the top with low variance: what this means is that across all different definitions of what constitutes the highest possible rating people could give, these cards fit all of them. Also, in my personal opinion, the cards here with low variance scores are probably all worth having dedicated articles written about them. No card in Dominion is completely useless, but it seems that these cards are about as close as they come. It’s no surprise that five out of these bottom twelve cards were removed for the second edition of Base and Intrigue. If you want to make these cards work, you’re going to either need a ton of support (such as the Travelling Fair/Counting House combo or the Herbalist/Phil Stone combo) or a very weak board so that the marginal effects and somewhat high opportunity cost of these cards is mitigated (almost all of them are terminal and the two that aren’t either require a Potion to buy or is Scout). I’m not going to say you can always ignore these cards, so I’ll just say you can almost always ignore them and do pretty well. OK, first of all, what does all of this mean? So I’ve taken every card-shaped object and categorized it according to 12 things that I thought might be useful. Let me start by saying that a lot of the definitions of these things are not entirely agreed upon, so I used my own definitions. If you disagree with my choices on one or two of the cards, sorry! You’re welcome to make a copy of the data and tinker with it yourself to see how things change. Then, I wanted to capture statistics about each type of card in isolation and compare it to the statistics about all cards. 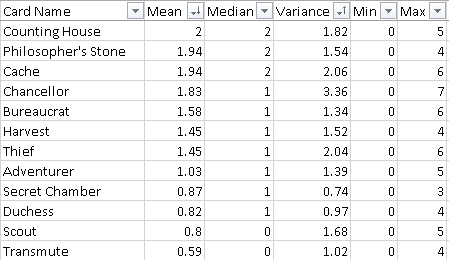 So the data at the right is the average mean, median, and variance for all Dominion cards. Looks like the average Dominion card has a 5.7 mean and 2.3 variance, so that’s the baseline we’re working with. Then, we can look at the categories and see what the differences are. The bottom section is the same data, only it’s the difference between the stats-by-category and the overall stats that we’re looking at — I just subtracted out the overall averages in case looking at those numbers is easier to digest. So what does this all mean? A few things. First, it seems that the community believes that villages and draw cards are pretty good, and that defense cards are pretty bad. VP and Treasure cards aren’t considered powerful overall, +Buy, Attack, and Trashing cards are considered pretty powerful. Not the most useful thing because it’s so abstract, but I don’t think I’d disagree with it. The valuable thing here is that these can be used as reference points later on, for example, when we choose to look at just the victory cards — we’ll want to keep in mind that the ratings for VP cards are going to be a little more pessimistic than overall ratings, and maybe it will make more sense when we compare victory cards to one another. The “average variance,” what does that even mean? So higher numbers here represented where the community disagreed more on how each individual card should be rated. It means that there’s less consensus on the precision of these ratings, so more is left open to interpretation. Some would consider the median of a data set more valuable than the mean when the variance is high, so that’s something to keep in mind as well. For example, it’s pretty well agreed upon that villages and draw are pretty good. VP cards and Landmarks, on the other hand, seem a bit more difficult to judge in a consistent way. So with that said, we can look at every category of card and see how things shake up. I’m not going to address every one of them in this article but I will address the four categories that I think will be the most instructive: Landmarks, villages, VP cards, and trashers. Comparing Dominion cards to Landmarks can be difficult to understand, partially because I don’t think it makes much sense to do so, so I think it’s especially useful to look at them separately. 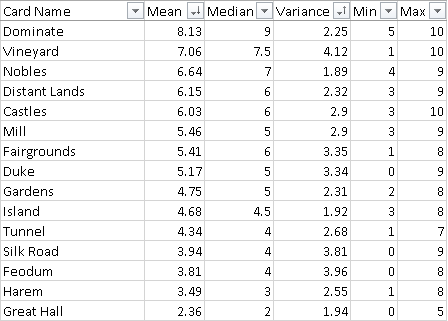 Keep in mind that the variance on Landmarks is higher than other categories of cards, so you may want to pay special attention to the median even though the cards are sorted by mean in this picture. What can we get from this data? I see a couple of useful things. First, the bottom four Landmarks; Baths, Aqueduct, Basilica, and Arena; have some of the lower variances, so we can feel pretty good about the idea that these are four of the least impactful Landmarks around. It also looks like the top five Landmarks; Keep, Tomb, Museum, Wall, and Wolf Den; deserve a bit of a distinction as being pretty powerful. I can’t say this for certain but I suspect that unpopular cards tend to have higher variance than normal, and this probably hurt Wall and Wolf Den in this case. Those Landmarks can be unpopular simply because they give negative VP instead of positive VP. Same thing with Bandit Fort to a lesser extent. The villages, or by my definition, any card that allows you to play more than one terminal action in a turn. 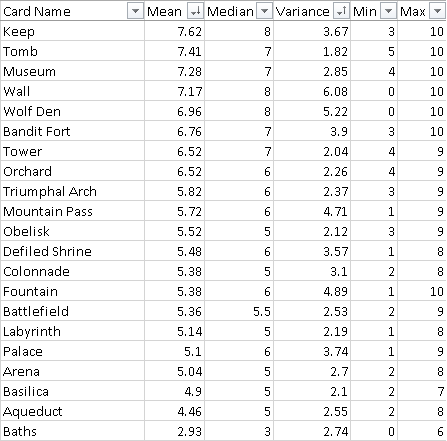 The data for this is pretty tight, actually; variance is quite low on every card here except for Prince (which is not a conventional village by any stretch). What kind of information can we get from this list? Let’s start by looking at the bottom of the list for the cards on the lower end. Many of them don’t draw a card, and/or don’t always give the village effect. When compared to a lot of other cards which can do those things and more, they end up on the bottom of the list. So if you’re looking for a village and all you have are those guys, you’re going to have a tougher time. Let’s look at the top of the list; a lot of these cards will give you the village effect along with something else, and that’s what truly sets them apart. King’s Court, Page, Peasant, Border Village, City Quarter, Sauna, Wandering Minstrel, and Lost City all fit into this description: they’re good at being villages but they’re also good at something else. So what about the cards near the top that I didn’t list? Lost Arts, Fishing Village, and Villa. Each of these cards has a unique effect that makes it so good that it appears high on this list in spite of its other potential weaknesses. Lost Arts on a terminal draw card makes drawing your deck trivial. Fishing Village gives you actions at the start of your turn, which is when they are far more useful than any other time. Villa is broken as heck because you can play it after you have zero remaining actions (among other insane interactions). These are cards to look out for. It can be useful to look at just the victory cards in relation to each other, mostly when assessing the potential strength of strategies that want to pursue points in this way. It’s similar to Landmarks (especially the ones where you aren’t limited to a certain number of VP) in some ways. The variance is pretty high on almost all of these cards, so the conclusions you can draw from this data are going to be a bit fuzzier. 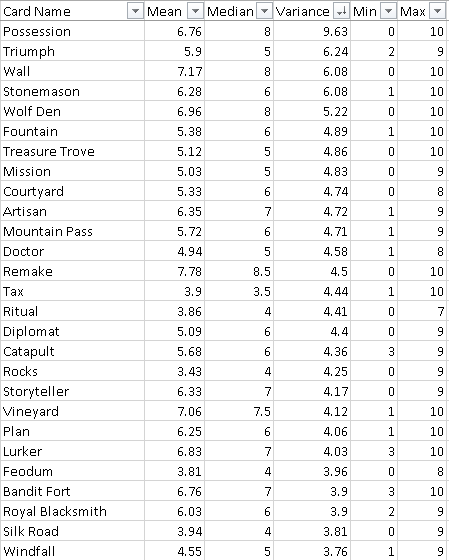 I think it’s useful to talk about the best cards on this list that just give you points: Dominate, Vineyard, Distant Lands, Castles. These are useful on quite a few boards that they appear on. Below them on this list are mostly cards that can provide support along side other methods of scoring points in the right situations. Trashing cards is really good. Not all trashing cards are created equal. Many cards aren’t very good at trashing other cards and for that reason, they appear towards the bottom of this list. I think Forge and lower on this list are good cards to keep an eye on, since they all are either very slow, or somewhat ineffective at removing bad cards from your deck in many circumstances. Similar to villages, looking at the top of this list can be instructive because many of the cards the top are there because they’re either really good at trashing, or they do something else besides trash cards. Ambassador, Governor, Inheritance, Masquerade, Sauna, Steward, Remake, Sentry, Counterfeit, Upgrade, Urchin, and Butcher all give great auxiliary benefits. Donate, Chapel, Ambassador, Steward, and Remake are all really good at trashing cards. Of note are the three cards that appear on both of these lists. Finally the “fun” chart. If I showed you the lowest variance cards, it would look like a combination of the top and bottom cards — it seems that those cards are easier to agree on. On the other hand, these are the cards that have generated the most disagreement. What does it mean? It means that the ratings on these cards are most likely to be inaccurate. It means that they’re the most likely to be talked about. Several cards on this list have a min score of 0 and a max score of 10 — how does that even happen? I think the main takeaway for me is that if anyone tries to write an article on any of these cards, or claim to have them “all figured out,” I’m going to be extra skeptical of them. It doesn’t mean they don’t know what they’re talking about, but a little extra healthy scrutiny would seem appropriate to me. By the way, my next article will be about Possession. Just kidding. So I’ve presented the data and given some different viewpoints on it. This article is already long enough so I’m going to stop it here, but there’s still quite a bit more to do with this stuff. Discussions about the rankings and about individual cards in relation to these rankings are easy and fun to have. I think if I write more card articles, I’ll start at the top of the list and pick cards I feel comfortable with. Also, I plan to make a video in the near future about cards I rated differently enough from the community average that it’s worth talking about. I’ll take a closer look and see if maybe I got it wrong, or if I want to double down and say I have some insight that the community just isn’t seeing. Guess which one there will be more of? This entry was posted in Dominion, Tabletop Games on September 6, 2017 by Adam Horton.